On May 8th, a somber memorial is paid to a man who gave the maple leaf flag a dynamic presentation to the world of motorsports. An life lost in 1982, the 30th anniversary since the death of Gilles Villeneuve recaps the soul of a determined, enthusiastic person who left meant something to Canada. Born in 1950 in the Southern Quebec town of Richelieu, French-Canadian driver Gilles Villeneuve pursuit into motorsports started with the straight-line action of drag racing at 17 years old. Tiring of drag racing, Villeneuve would quickly obtain a passion for the challenge of corners. Winning the Formula Atlantic title back-to-back in 1976 (actually collecting both a US as well as Canadian title offered that year) and 1977 season, Gilles Villeneuve's career-making moment was at the 1976 Trois Riviere race. Villeneuve was not only victorious in the legendary Canadian street race, his talent behind the wheel captured the attention of a Formula 1 driver James Hunt (a popular McLaren driver who went on to win the 1976 World Championship). Hunt's McLaren team would offer him a two-year old race car to drive at the British Grand Prix in last year. A race that resulted in an 11th place run, Gilles Villeneuve's was most impressive for how he was able to find lap times as fast as the leaders after the course of the event. Villeneuve would be drafted by the the Ferrari team for the final two races of the 1977 season. Making the big-time in motorsports with a full grand prix season in 1978, Formula 1 success would not be instant for the Canadian. In the 16-race season, the passionate Villeneuve's scored just 7 points in the first 15 races. A driving personality that quickly won over fans not only in Canada but throughout the racing world, Gilles Villeneuve's hard-charging driving style badly-needed to be complemented with a major Formula 1 success. 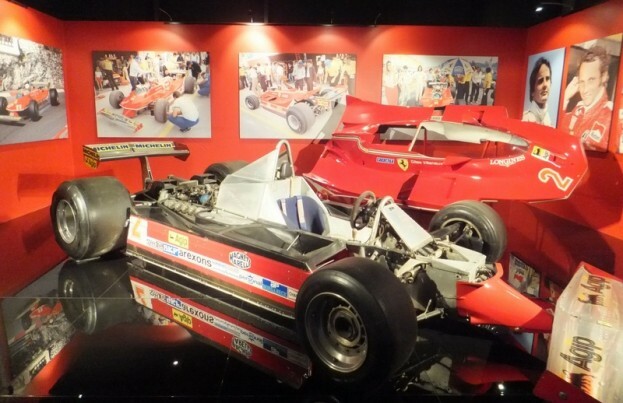 For the very first Canadian Grand Prix to be held at the Ile Notre Dame circuit in Villeneuve's home province, the Ferrari drive capped the 1978 season with his first-ever Formula 1. The race track would later be named in the honour of Gilles Villeneuve. The victory for Villeneuve proved himself to the racing world with a large Canadian crowd cheering on their first-ever Formula 1 grand prix winner. In 1979 Formula 1 season, Gilles Villeneuve's best grand prix season would include three wins and a second-place finish in Formula 1 driver points to Jody Scheckter by a narrow 4-point margin. Despite plateauing to the highest heights in Formula 1, he remained a dedicated husband and a father to children Melanie and Jacques. Undoubtedly this relationship kept Gilles Villenueve grounded through what would be some hard times. Into the disastrous 1980 season where the Ferrari team's 312 T5 race car and Flat-12 engine was seriously off the pace. A drastically improved Ferrari Formula 1 car the following would glide Villeneuve to two more grand prix wins at Monaco and Spain. As the driver and team regained winning form, the 1982 Formula 1 season was poised for a revival to the form of 1979. At the 1982 San Marino Grand Prix, a potential win was foiled by Villeneuve's teammate Didier Pironi in what was a very controversial pass. While Pironi's move was perfectly legal, there existed an informal agreement within the Ferrari team that a team car should not attempt to pass the other teammate on track. The relationship between Pironi and Villeneuve was turbulent heading into the Belgium Grand Prix. It was qualifying for the Belgium Grand Prix on the Spa-Francochamps circuit that Gilles Villeneuve would spend his last moments of life. A high-speed collision between Villeneuve's Ferrari and the March of Jochen Mass occurred violently tearing apart the race car as it went airborne. A crash so horrible, Villeneuve's helmet was thrown off his head. As fellow race competitors and doctors rushed to the scene of the crash, the Canadian racer's severe injuries would be fatal. On May 8th, 1982 at 9:12 PM local time in Belgium, Gilles Villeneuve was lost to the most tragic element of a sport he loved so much. Known to most of the world as a six-time grand prix winner, Gilles Villeneuve became an idolized figure for Canadian open wheel racers who emerged in greater number through the decades following the Ferrari Formula 1 driver's lead. One of those campaigning drivers in the 1990s was the son of Gilles Villeneuve. Jacques Villeneuve's triumphs at the Indy 500 as well as the IndyCar World Series in 1995 and eventually a 1997 Formula 1 World Championship also rewarded his pioneering father's legacy. The son of Gilles Villeneuve retains the most meaningful, most honest connection to a man many Canadians see as a legend. In the 30 years since the passing of Gilles Villeneuve, we reflect on the life of the Canadian auto racer lost way too soon in numerous ways. While some of us honour the athlete as a great citizen who has given a nation a unique sense of pride, other see the French-Canadian drivers as someone more empowering. Gilles Villeneuve's love and desire towards a desire achievement personifies what others in motorsports, in sports and even in the complex lives we all inhabit. On figurative race courses, we all seek to travel quicker down the straights, take the nearest corner with extra control, lead the way for what would be a popular, celebrated victory. The life of Gilles Villeneuve made him a winner on every stretch. The following video from Italy's Rai TV is coverage of Jacques Villeneuve connecting with the #12 Ferrari 312 T4 driven during his father's most successful 1979 season in Formula 1. In tribute to his father, Jacques Villeneuve turned laps in the classic race machine around Ferrari's Fiorano test track.